A stupid, surreal, one­-man Sesame Street – preposterous tales from a forgotten cloakroom. 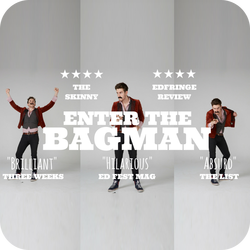 The sequel to Brendan Murphy's "incredibly engaging" (★★★★ The Skinny) 2015 debut, BAGMAN. The deadbeat character comedian returns with his "truly unique" (★★★★ ThreeWeeks), "absurd, bag-themed cabaret" (★★★★ EdFringeReview) directed by Hamish MacDougall - director of Joseph Morpurgo's award-winning 'Soothing Sounds For Baby' (2015) and Abandoman's 'Life + Rhymes' (2016). This productions contains some strong language. Ticket purchases are non refundable. Concession prices apply to students; under 18s; pensioners; those on disability and unemployment benefits; Equity, BECTU & SDUK members; Portico Places cardholders. ​As a young venue we are still upgrading and developing the space, any additional donations are much appreciated and will be used towards improving the theatre even further and keeping the venue going in the long-term.